Creating a website or blog in the 21st century has never been any easier! With the plethora of website building platforms and tools out there, it’s as simple as finding the right website host and either building your website from scratch or using a website builder. For my website, Journey of an Architect, I’ve been using Bluehost as my website host and I’ve had a fantastic experience with their services and customer service. 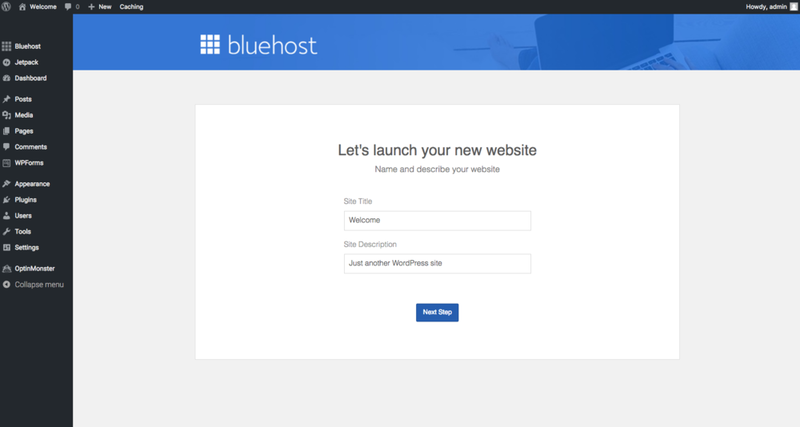 If you’re ready to start your own website and want the process to be simple, here are 7 steps showing you how you can start today with Bluehost. To get started with Bluehost as your website host, go to their website by clicking here. Once you’re on their homepage, take a moment to review their information about what comes with your purchase. In my opinion, the two best parts of using Bluehost is that they provide 1 click WordPress installation for your website and their customer service is fantastic. I’ve had several interactions with their customer service representatives with some questions about my website and they have been able to answer my questions and even walked me through the process of setting certain parts up. This is a great asset if you haven’t created a website before. Once you’ve reviewed the information, click the get started now button. When you get to the plan page, you’ll see 3 different options that you can choose from. For many people, the basic plan is the most popular option for beginners and people who will only have 1 website. If you plan to have more than 5 people contributing to your website and know that you’ll have lots of content to share, the plus or prime option is the way to go. With Bluehost plus, you’ll get unlimited space for your website and could host multiple websites within 1 account. You can also create an unlimited amount of email accounts, which is useful for websites and blogs that will have more than 5 contributors. After selecting your plan option, you’ll be brought to Bluehost’s domain page where you’ll find the right name for your website. Type in the name that you want for your website, click next, and Bluehost will check if the domain name is available. If the name is unavailable, they will recommend several options that are available and you could choose from their list or come up with additional names until one of them works! Once you’ve found an available domain name for your website, you’ll be brought to the account creation page where you’ll fill out your personal information and select a package from Bluehost. Their plans are charged on an annual basis, but if you choose to pay for 3 years (36 months), you’ll get a better price from Bluehost. I chose to pay upfront for the 3 year option. I recommend reading about the additional add-ons like the Site Backup Pro, which will keep a copy of your website’s content in their database in case your website is corrupt or lost, and the SiteLock Security – Find, which regularly scans your website for any malware and shows your website or blog as a trusted site in search engine results. When you’re done creating your account and selecting the plan and add-ons for your account, you’ll be brought to the payment information page. Type in your information, read Bluehost’s terms and policies and submit your payment. Now, you’ll have to create a password for your account. Keep in mind that your account login name will be your domain name and your password will be whatever you decide in this step. After logging into your account, you’ll be brought to the website themes page where you’ll be able to browse hundreds of thousands of layouts for your website. These themes are all for WordPress, which is one of the most used website and blog building platforms online. It’s a very simple and intuitive platform to use, so don’t worry if you’ve never built a website before. During this step, take your time to find the right theme to showcase your content. Will you have more images and photographs? Or will you have lots of text? Is it a combination of the two? If you’re looking for something specific or different from this selection, you can purchase from hundreds of thousands of themes online or even hire someone to build your website on WordPress to look exactly how you want it to look. Now, you’re ready to start building your website. You’ll be brought to your WordPress dashboard, which is the where you’ll add all of your content for your website. What’s fantastic about the Bluehost to WordPress transition is that they will walk you through every part of building your website. Best of all, there are lots of tutorials and huge WordPress communities that can help answer any questions you have along the way! On this initial page, select the kind of website you’ll be building – either business or personal. Then, follow the steps to launch your website and you’ll be online in no time! Now that your website is online and ready for the world to see, you’ll want to setup email accounts and potentially purchase more domains for other websites in the future. To do this, you’ll log into your Bluehost account and be brought to the Bluerock Cpanel, which is where you’ll manage all of your websites. On this page, you can access your WordPress interface, purchase additional tools for your account in the Marketplace, setup emails by following the Email tab, search and purchase additional website domains by clicking Domains, access any additional options in the Advanced tab, or chat with a Bluehost representative by clicking Live Chat. Don't hesitate to chat with a representative with any questions. They’ll walk you through everything you need step-by-step! With your website underway, I’m sure you’re excited to share your business, content, and life with the world! You’ll definitely have lots of fun and moments of distress as you continue learning to build your website, but once you’ve done it for a few months, the process will be second nature to you! Having Bluehost as my website host has been a great decision and I’m sure you’ll enjoy their services as well. As an affiliate for Bluehost, I want to let you know that if you decide to use Bluehost for your website, I’ll earn a small commission with no additional cost to you. Have a fantastic time creating your website and feel free to contact me and let me know what your website is so that I can check it out!